Turkish scientists developed a new method for simultaneous and rapid diagnosis of cancerous cells that would be used in surgical treatments, which is expected to fill the void as the existing oncological surgery techniques fail to meet the needs. 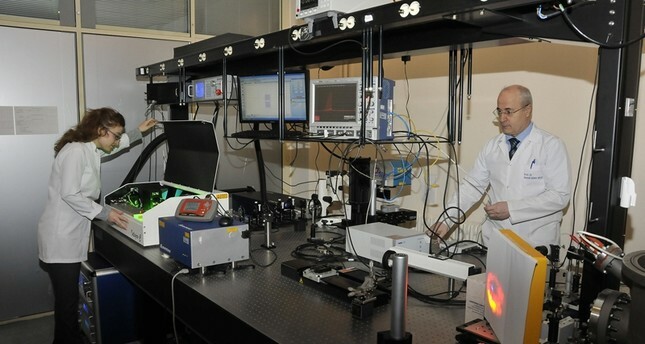 A group of scientists from Selçuk University in central Turkey's Konya province developed the method in order to provide an efficient diagnosis to complement surgical techniques used in cancer treatment. With the new method, surgeons can use laser beams that focus on the biological tissues and form a plasma consisting of biological molecules, which is pumped to the interaction zone of a high resolution mass spectrometer and can be analyzed. Even though the biological molecules have similar fragmentation patterns when exposed to laser radiation, their basic mass component densities are different and this distinctness works like finger prints for the molecules and special statistical methods can reveal the main differences between them. Benefiting from this, the new method reveals the differences between healthy and cancerous cells as well as the different cell types by using the technique of laser desorption mass spectrometry (LDIMS). The head of the research team Professor Dr. Hamdi Şükür Kılıç told reporters that each year four or six people get cancer treatment in developed countries and even though the surgical treatment is one of the best, it has some undesirable obstacles. Underlining that the surgeons cannot clearly see the borders between cancerous and normal tissues and thus some of the cancerous tissues remain in the body after surgical intervention Kılıç said: "If the surgeon is unsure whether the tissue is normal or cancerous, it is sent to the pathology branch for testing." Adding that these pathological tests take 20 or 30 minutes, or longer, and the patients are kept under anesthesia during this time. Kılıç said that the new technique which allows surgeons to distinguish between the cancerous tissue and the healthy tissue "significantly reduces the need for additional surgery," while causing no cuts or bleeding in the patient's body and protecting sensitive organs such as the lung, kidney, liver, chest and main vessels. Saying that this new, high-tech system can be used in every clinic, Kılıç added that the prototypes were already produced and now they are working on obtaining a patent for the study.